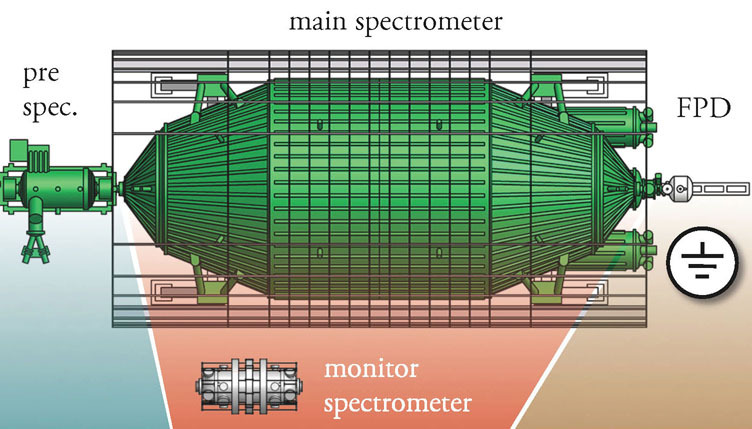 The Pre-Spectrometer rejects most of the low-energy decay electrons, which carry no information on the neutrino mass. The Main Spectrometer measures the kinetic energy of the electrons passing the pre-spectrometer with energies close to the endpoint of the beta spectrum. The Monitor Spectrometer measures the position of the monoenergetic conversion electrons from 83mKr decays. It serves as a high precision "volt meter", monitoring the voltage stability of the main spectrometer. The main spectrometer has to analyze the endpoint region of the tritium β spectrum with an unprcedented precision.. All electromagnetic properties have to be known very precisely and kept under strict control. Like the pre-spectrometer it operates as an electrostatic spectrometer in the MAC-E filter mode. More details are given in our design report 2004. 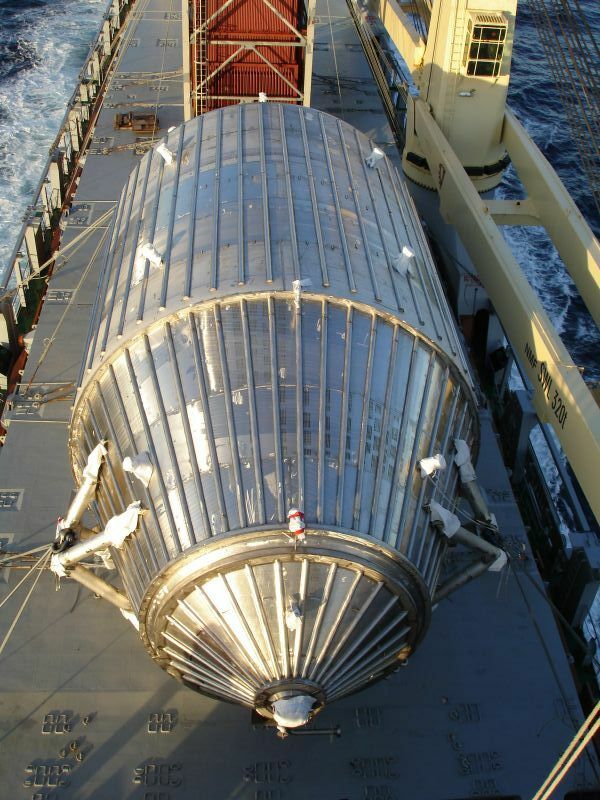 The combination of a large recipient and stringent ultra high vacuum (XHV) requirements presents a technological challenge, since XHV vessels of this size have never been built before! The main vessel is manufactured from stainless steel sheets, type 1.4429 (316LN), selected both for its strength and excellent magnetic properties especially in weld regions. The weight is approximately 200 tons. There are limits on the amount of cobalt permitted in the steel and on its residual radioactivity to minimize background in the spectrometer. The thickness varies from about 25 to 32 mm. Three pump ports, each of 1.7 m diameter, are attached at the downstream end. A piping system for heat transmission by thermal oil is realised by soldering U-shaped stainless steel profiles to the surface. The tank stands provide an electrical insulation (marked yellow in fig.1). three pump ports with a diameter of 1.7m and a length of ≈ 3 m. Each pump port will terminate in a large flange, similar to the one tested in the pre-spectrometer. the electron beam will enter the spectrometer through a ground electrode attached to a ceramic insulator on a 500mm flange, similar to the design used for the pre-spectrometer. during bake-out at 350°C the vessel will expand by 20 cm along the axis. In order to prevent damage to the upstream sections, it will be fixed to the floor at its upstream end. The downstream end will push back the transport section and the detector. Therefore all downstream installations have to be mounted on rails. The vessel has been ordered in December 2004 and was delivered to FZK in November 2006. The electrode design is based on the concept that the vacuum tank itself serves as a guard electrode for the more accurate high voltage on the inner wire electrode system. The electron beam enters and leaves the vessel through conical ground electrodes attached to the spectrometer via ceramic insulators. The actual design of the inner electrode system and of the ground electrodes has been optimized further compared to fig. 2. Stringent requirements on the homogeneity of the electric retarding potential and the magnetic field in the analyzing plane are necessary to reach the ambitious energy resolution of 0.93 eV and to suppress systematic errors. Small inhomogeneities of the electric retarding potential and of the magnetic field in the analyzing plane will be compensated to first order by the good spatial resolution of the detector. The electron flux through the analyzing plane will be projected on a segmented electron detector, which has a resolution of about 400 pixels (20 × 20). Each pixel corresponds to a certain area on the analyzing plane. The inhomogeneities of the electric potential and of the magnetic fields have been calculated and can be used to correct deviations for each pixel. The inner electrode system will suppress electrons from the spectrometer wall. It can be also operated in dipole mode, throwing out trapped electrons: If the electrodes are split into two halves (left and right sides) and put on different potentials by short pulses of up to 1 kV on one electrode, electrons passing through this region will feel a drift perpendicular to the electric dipole field E and to the magnetic field B. During these pulses the measurement would be paused. The inner electrode system will consist of about 200 wire modules with a weight of 20–30 kg each. 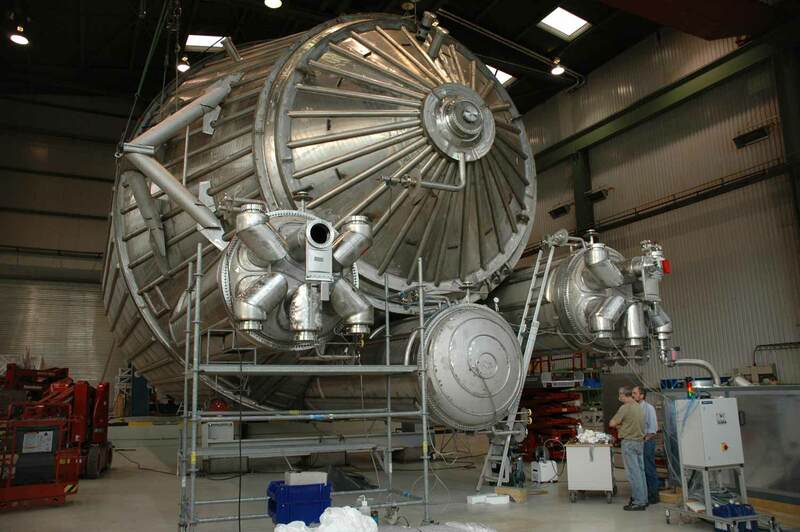 These modules will be brought into the spectrometer through one of the large diameter flanges (pump ports) and mounted via electrical insulators onto the walls. An ultra-high precision high voltage system will feed the different wire layers and wire sections as well as the outer vessel with the necessary voltages for the normal monopole and the dipole mode. High precision variation of the main spectrometer potentials will be possible for scanning the β spectrum near its endpoint. The main spectrometer has been manufactured by MAN DWE at the Deggendorf plant adjacent to the river Danube (Donau). Fig. 4 shows the downstream end of the vessel with the three pumping ports. Only two ports will actually be equipped with mechanical pumps. Vacuum tests started a few days after the picture above was taken. Only one pumpiing system (fore-pump and turbomolecular pump) was used. The instrument which measured the vacuum was in the pumping port which was not used for pumping. After pumping for two days with the fore-pump alone, a vacuum of 1.5×10−3 mbar was achieved. Switching on the turbo gave 2×10−5 mbar after one hour, going down to 3×10−7 mbar after a few days. Then another turbo was put between the two pumps in order to reduce the pressure ratio between pump entrance and exit.. This brought the pressure down to 8×10−8 mbar after a short time. This is an excellent value, especially for the first try with a newly built vessel of this size, and demonstrates a proper design, quality control, and good craftsmanship during the manufacturing of the vessel! Our goal is to achieve a vacuum at least four orders of magnitude better than the value reached now. Therefore a test to find tiny leaks with a helium leak test device followed the vacuum tests. No leaks were found, and after that we can be confident that we will reach the required vacuum by temporarily baking the tank under vacuum up to 350°C to force the gas out of the walls, using four instead of one pumping systems, and by the getter strips (see pre-spectrometer) which are activated by heating and are highly efficient to remove hydrogen which is the main component of outgassing from steel at XHV conditions. After the leak tests the tank was ready to be shipped. There is a slight problem of transportability from Deggendorf to Karlsruhe: The tank is too big for motorways, and the canal between the rivers Rhine and Danube has to be ruled out, too. Thus, instead of a journey of about 400 km, the spectrometer has to travel nearly 9000 km as indicated in the map. *) Map courtesy of the University of Texas Libraries, The University of Texas at Austin. 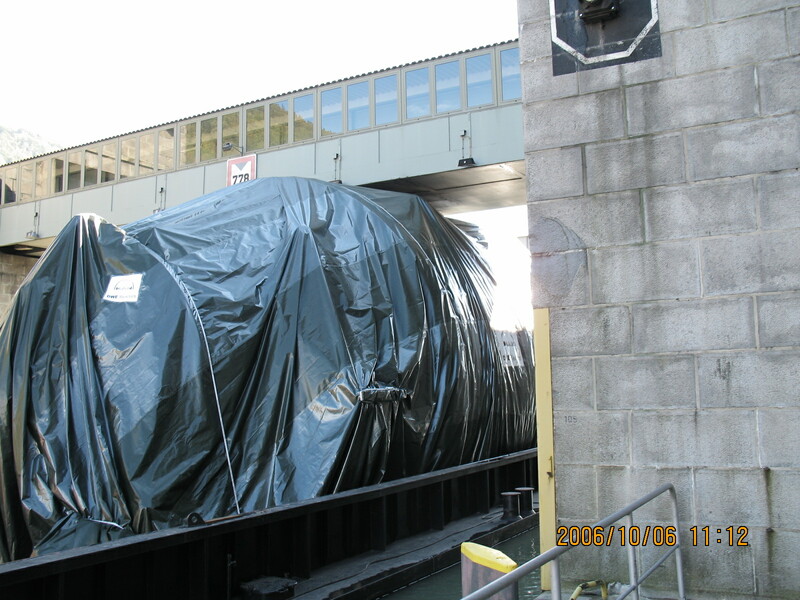 September 28, 2006: The main spectrometer was loaded onto the river barge "Taifun" (i.e. "typhoon"!). Eight days later, after picking up ~1400 to of gravel and 800 to of water as ballast, the vessel managed to pass the bridge at Jochenstein lock (left) with a luxury safety margin of 7cm (!) on top and continued its journey safely in Austria. The next critical point was Wildungsmauer between Vienna and Bratislava where some ballast had to be unloaded to manage the water depth. The Danube delta was reached mid October. 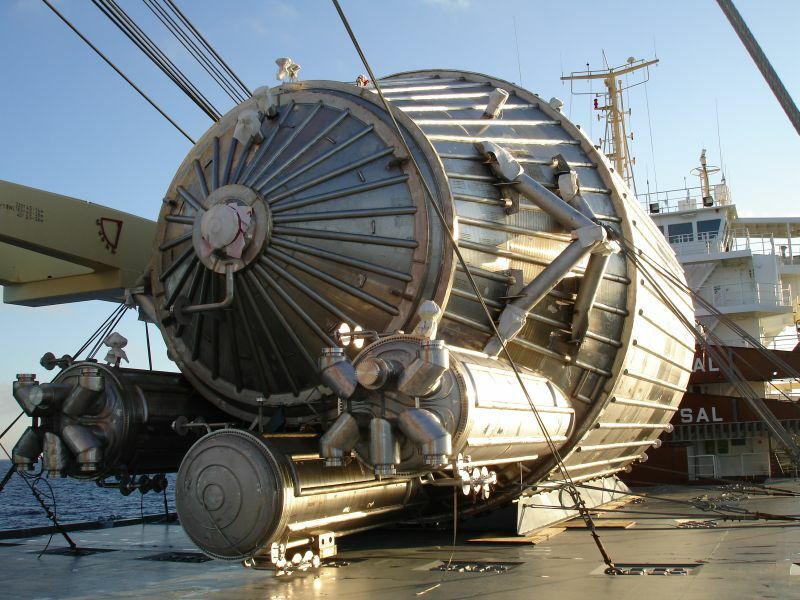 At the port of Constanta the main spectrometer vessel was transferred to the sea-going ship ANNEGRET which left port on October 31, 2006. After a rough ride through the Black Sea aboard the ANNEGRET the spectrometer vessel passed the Bosporus and reached the port of Augusta / Sicily on Nov 6. The storm blew away the protective cover so the spectrometer can now be seen in all its glory, meaning that a bit of cleaning will have to be done! At Augusta the spectrometer was transferred to the SVENJA to carry it to the estuary of the Rhine. 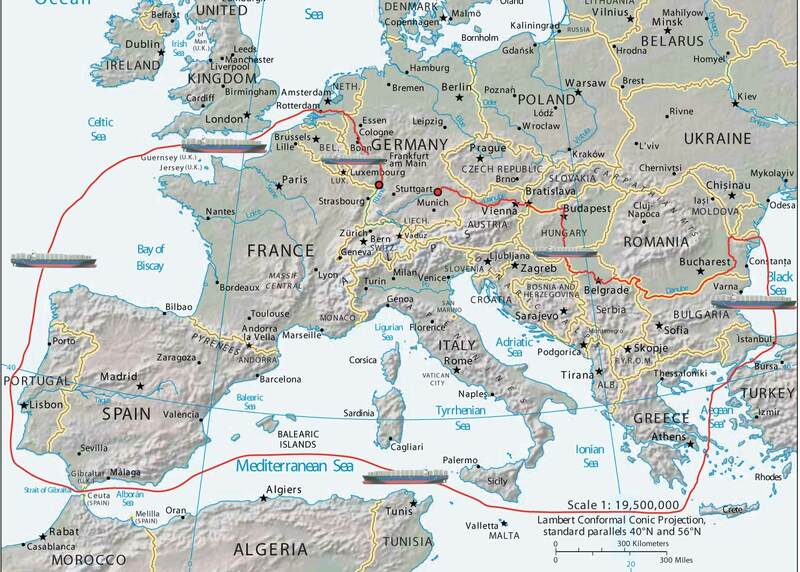 After a short detour to the port of Civitavecchia near Rome, the SVENJA went due west to pass the straits of Gibraltar on November 13, then turned north to reach the estuary of the river Rhine on November 17. 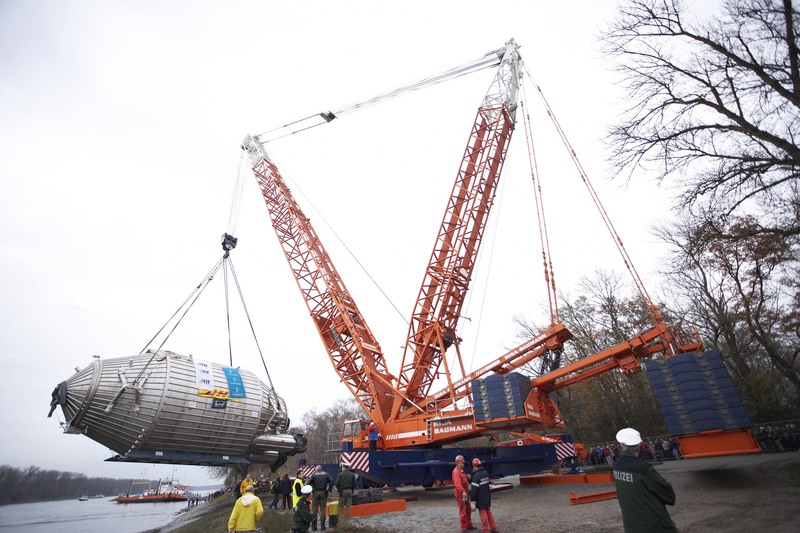 Nov 23 (Th) Assembling of a heavy lifting crane started at Leopoldshafen (at the "NATO ramp"). 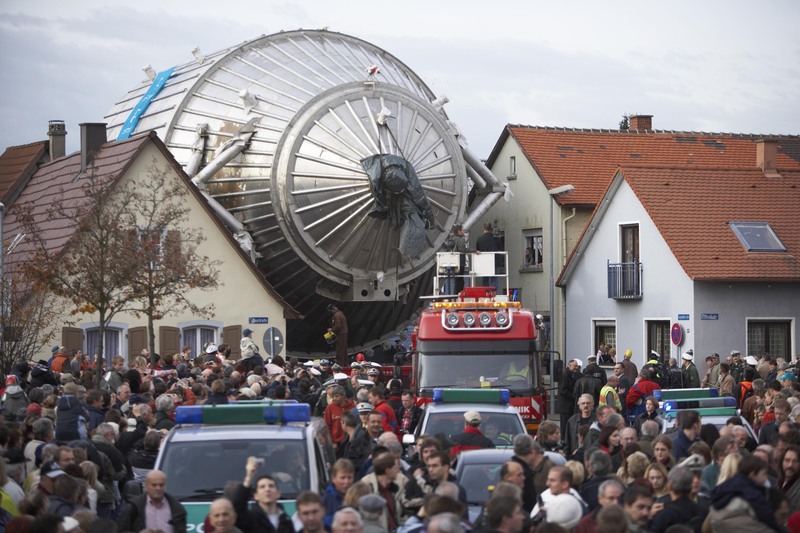 Nov 24 (Fr) The main spectrometer vessel arrived at Leopoldshafen. Nov 25 (Sa) morning The spectrometer vessel was loaded onto a carrier vehicle by the heavy lifting crane. daytime The vessel was transported to FZK through the village of Leopoldshafen. Nov 29 (We) The spectrometer was lifted over the side walls of its new hall into the final position. The main spectrometer has now safely reached its destination! Fig. 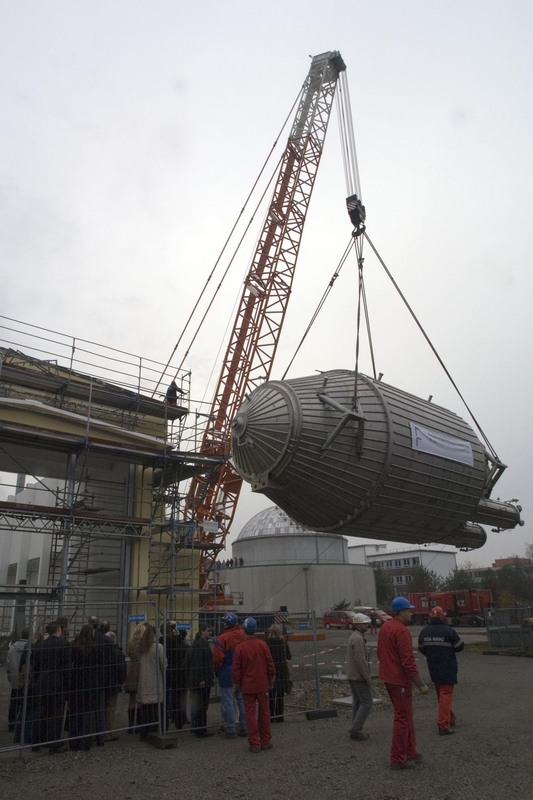 11 (left): Lifting into the spectrometer hall starts. 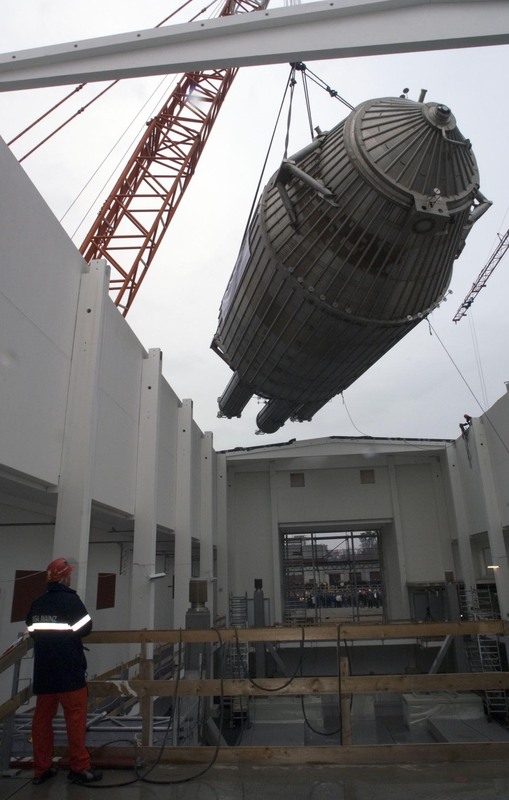 (right): The vessel comes through the roof.